Shimadzu has produced an application note describing the Nexera-UC online SFE-SFC system that was used for efficient analysis of alkylbenzenesulfone from a swab (cloth used for surface wiping to show safety at a pharmaceutical manufacturing site). Cleaning validation is a process step that is extremely important for ensuring high quality and safety at pharmaceutical manufacturing sites. Cloth used for surface wiping, called a swab, is used to wipe a given part of a piece of manufacturing equipment, and analysis of the wiped area of the swab is performed by using high-performance liquid chromatography (HPLC) or a total organic carbon analysis (TOC). Evaluations using HPLC have been increasingly used in recent years because HPLC enables determination of individual compounds. Prior to analysis, an extraction procedure must be performed on the swab. Using supercritical fluid extraction (SFE) as the pretreatment method allows for simple and quick target component extraction. Using supercritical fluid chromatography (SFC) after SFE also means that analysis results can be obtained simply by preparing the sample for SFE, which unifies the work flow from pretreatment to analysis. 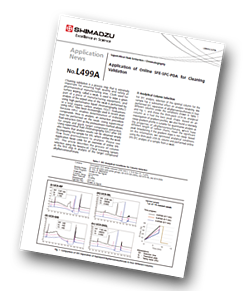 This application note describes the process of column selection using the Nexera-UC Chiral Screening System as the first step in analysis of the target compound alkylbenzenesulfonate. For SFC analysis, selection of the optimal column for the sample has a substantial effect on analysis reliability. SFC separation of alkylbenzenesulfonate was performed in four different columns and the Shim-pack UCX-SIL analytical column was selected as it had the best peak shape. Based on an investigation of gradient profiles, it was found that a relatively steep gradient profile is suitable for quantitative analysis as the properties of alkylbenzenesulfonate, which have different length of carbon chains, mean the significant peak broadening of the gradient slope is not steep. Based on this information, analytical conditions were optimized using the Shim-pack USX-SIL column and online SFE-SFC analysis was performed using a sample from a swab. 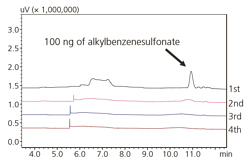 After systematic optimization for column selection and gradient conditions, the surfactant alkylbenzenesulfonate was detected with good peak shape and separation. The quantitation parameters for evaluation were obtained and they were satisfactory results. The results demonstrated the simplicity and usefulness of the Nexera-UC system where supercritical fluid chromatography is used for both extraction and analysis.